Home > Shop By Brand > Buff and Shine Buffing Pads > Buff & Shine Uro-Tec Foam Pad System > 3 inch Buff and Shine Uro-Tec Foam Pads > 3 inch Buff and Shine Uro-Tec Foam Pads - 6 Pack Choose Your Pads! Perfectly balanced for an unrivaled finish! Uro-Tec Foam Pads are the latest innovation from Buff & Shine, a leading manufacturer of foam, wool, and microfiber buffing and polishing pads. The 6 and 7 inch Buff & Shine Uro-Tec Pads are developed specifically for “long throw” orbital polishers such as the Rupes LHR 15 and 21, Griot’s Garage BOSS G15 and 21, and the new FLEX XFE. The smaller pads work perfectly with the RUPES iBrid Polishers and the Griot's Garage BOSS Air Mini. Uro-Tec Foam Pads deliver uncompromised performance on all paint systems and longevity that is superior to anything else on the market. Buff & Shine has a reputation for manufacturing buffing and polishing pads that can withstand repeated use without failure, and their latest innovation continues this trend. Uro-Tec Foam Pads are constructed out of super durable open-cell foam which allows long cycle times without reduction in performance, and the ability to dissipate heat quickly. This results in a pad that lasts longer without any loss in cutting or finishing abilities. The 3 inch Buff and Shine Uro-Tec Foam Pads fit the 3 inch Griot's Garage Orbital Polisher perfectly for improved polishing in small areas. Uro-Tec Foam Pads were designed and engineered from the ground up for use with long throw orbital polishers. From the unique foam construction to the thickness of each pad, Uro-Tec Foam Pads will blow you away with how smooth they are on your long throw polisher. And with Buff & Shine’s legendary durability, Uro-Tec Foam Pads will be one of the smartest investments you’ll make in car care. Buff & Shine Uro-Tec Foam Pads are available in heavy cutting (blue), heavy polishing (maroon), polishing (yellow) and finishing (white). From our testing, we’ve found that Uro-Tec Foam Pads are compatible with the leading manufacturers of buffing and polishing compounds, including Menzerna, Meguiar’s, Wolfgang, 3D and more! 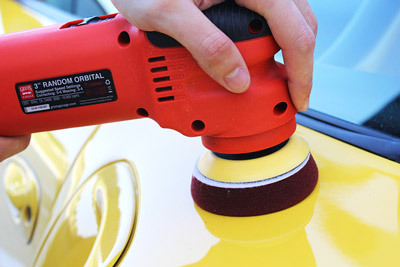 Use with confidence and enjoy the new-found smoothness of your long throw orbital polisher! Please note, the 3 inch Buff and Shine Uro-Tec Pads actually have a 3.5 inch foam face and a 3 inch backing. A 3 inch backing plate is needed to use the 3 inch Buff and Shine Uro-Tec Pads.